London's only Olympic sized heated outdoor swimming pool, the luxurious London Fields Lido was re-opened amid much excitement in October 2006 after almost 20 years of closure. It promptly won the Golden Goggles Award that year for the best place to swim outdoors in London. Just over ten years back, in 1997, things were not looking so good but thanks to the hard work and dedication of local people who spent two days clearing lorry loads of Buddleia bushes and weeds from the pool, surrounding walls and buildings the pool is back in business. 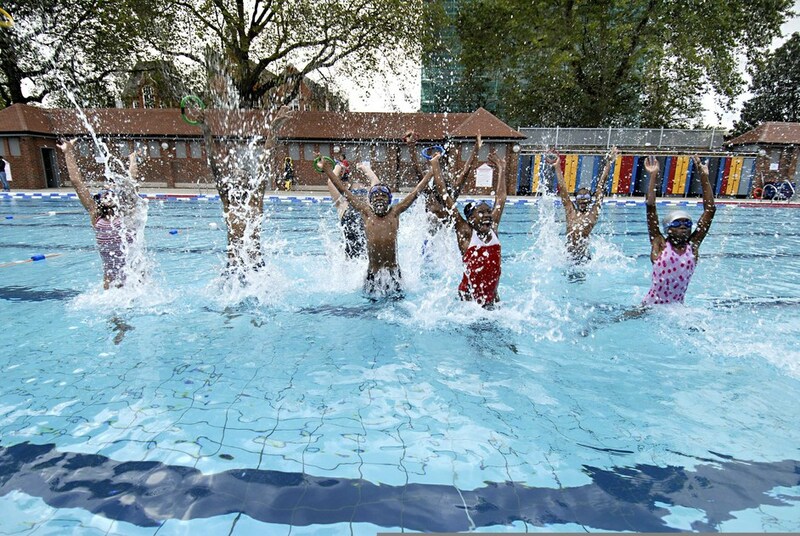 Now over-heated Londoners can float in the 50m pools 350,000 gallons of perfectly temperate water all year round. You'll find the lido in the north-west corner of London Fields Park in the heart of Hackney; enter from London Fields Westside. Bag a spot early in the day during the summer months as the place gets packed with sizzling bodies in search of cooling waters. Being built in the early 1930s, this lido is more elaborate than most and boasts substantial well-kept buildings including staff accommodation, first aid rooms, refreshment kiosks, plus individual and group changing rooms. Recently, further bike racks have been added along with improved security and queue control so there's no need to get over-heated while waiting in line for your dip. London Fields Lido gyms, sporting activities, health & beauty and fitness. What are the best dining options near London Fields Lido London? The best pubs near London London Fields Lido. London Fields Lido clubs, bars, cabaret nights, casinos and interesting nightlife. Where to have your meeting, conference, exhibition, private dining or training course near London Fields Lido. From cheap budget accommodation to luxury 5 star hotels see our special offers for London Fields Lido hotels, including Ace Hotel London Shoreditch from 85% off.